Evaluation Works is undergoing a transition in 2017 with Robyn Bailey’s departure. “After six busy years setting up and working closely with Rae to establish a valued and trusted evaluation company, it’s time to take a break,” says Robyn. “It has been a privilege working with Rae, and I look forward to future collaborations. One particular highlight of our work together was finding a straightforward but robust way to measure meaningful outcomes for people in the hard-to-measure areas of health and wellbeing,” says Robyn. “I look forward to keeping up with colleagues, developments in the evaluation field, and of course whatever Evaluation Works may be involved in next,” Robyn says. Rae Torrie will continue to lead the business and deliver the quality evaluation services that Evaluation Works is known for. “I am particularly mindful of the legacy Rob leaves behind in co-creating this business. We have created a practice that holds programme outcomes for intended recipients firmly in our sights while developing robust and appropriate approaches in any evaluative activities. 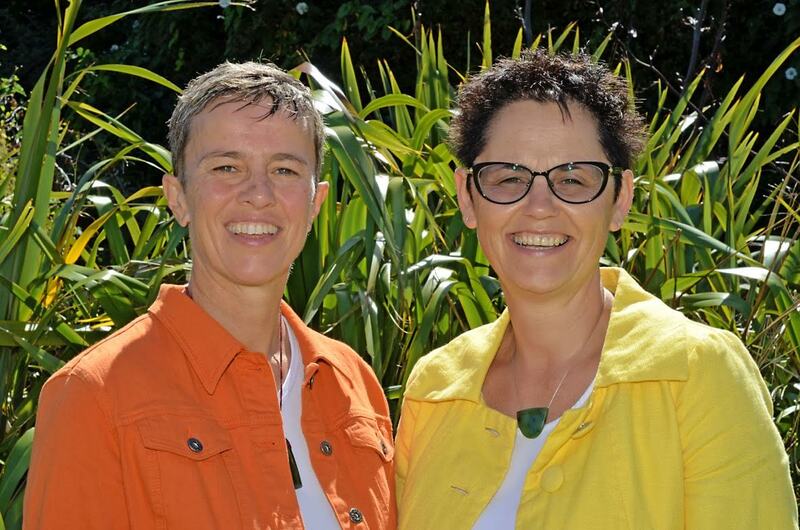 I will be bringing this kaupapa, and Robyn’s legacy, in how EW ‘does business’ with me into the future,” says Rae. In the meantime 2017 looks like an interesting year for Evaluation Works. More on that in the next update! We all know that measuring outcomes is important. At base it is about “knowing and showing that what you’re doing works”. Yet how best to proceed can be challenging. Evaluation Works take a straight-forward approach to working with organisations to identify and measure outcomes centred in your business, your kaupapa. We’ve produced an information page that explains what it’s about. Take a look. We define what we mean by outcomes, list the range of outcome services we provide, describe the benefits of a comprehensive outcomes system, and offer some useful definitions. Being able to show your organisation’s contribution turns client changes into client outcomes. An innovative approach to measuring youth health and well-being outcomes has produced benefits that can now be applied to other youth organisations and services as well as a wide range of NGOs. The project began when Wellington consultancy Evaluation Works teamed up with Kapiti Youth Support (KYS), an integrated, interdisciplinary Youth One Stop Shop, to measure the effectiveness of their service’s outcomes for youth health and wellbeing. To do this in a way that would satisfy clinicians, youth professionals, and funders meant developing a model from the ground up, that met their differing needs, was methodologically robust, reflected and didn’t change practice, and looked simple. “The key is the way in which the outcomes tool provides professionals from widely-differing disciplines in the organisation with a ‘shared language’,” says Evaluation Works principal Rae Torrie. “The outcome measures provide a kind of ‘shorthand’ and shared understanding that helps break down some of those silos that each discipline can find itself in,” says Torrie. Underpinning the KYS project was a ground-breaking model that Torrie and her colleague Robyn Bailey developed with KYS over a four year period. It included a detailed and standardised measurement process, descriptors and rating scale for youth health and wellbeing outcomes ranging from seriously at risk through to thriving. “A key part of the model’s design was that, while being conceptually robust and methodologically sound, it had to be simple and user-friendly for the professionals in the field to use,” says Bailey. “It turned out that these design principles were key. They led to the development of a successful tool when it could easily have become just another annoying data gathering exercise for staff with little relevance to their day to day work,” she says. The model developed by Evaluation Works in conjunction with KYS was designed from the start to be portable which means that other organisations will soon be able to benefit from this work. “The extensive work from this four year project on what outcomes look like, detailed descriptors and so on can give many organisations a quick path to capturing robust evidence of the changes made by people using their services” says Torrie. If you would like further information, go to Projects / Youth outcomes measurement. If you’d like to find out more about the Summary report from the project or to find out more about this project and how it can be applied to your organisation, contact Rae Torrie or Robyn Bailey. A summary report from the 3-year project will be available in early 2015. The report: briefly describes the KYS youth outcomes model and measures; demonstrates how the model and measures can be used at a whole-of-service level; provides evidence of ‘what works’ and is important when providing services to young people, particularly those who are hard-to-reach and have complex needs. 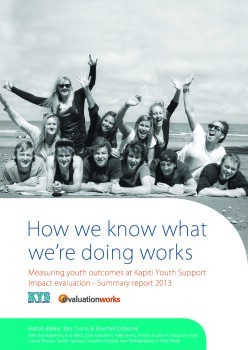 Evaluation Works and Kapiti Youth Support (KYS) were successful in 2011 in a joint bid for Health Research Council funding to capture evidence of the changes experienced by young people using the health and well-being services of KYS, a youth one stop shop. As there were no agreed set of national youth health and wellbeing outcomes measures, the project needed to develop a way of measuring the changes for young people, before it could assess the impact of KYS’s approach on the young people using its services. The developmental phase of the project involved researching and developing a youth health and wellbeing outcomes model and measures, and a ‘theory about how KYS works’ to enable positive health and wellbeing outcomes for the young people who use their services. Both the outcomes model and measures and the theoretical concepts were tested as part of the impact evaluation. Over 300 young people were tracked over a 3-5 month period, along with follow-up interviews with young people, their key worker at KYS and a parent or other significant adult.